If you’re a leader, you need others to do well. You can’t succeed without this. That means tapping every available tool. Using the placebo effect to your advantage is one. Yet, too often, leaders leave it behind. Most know of placebos in medicine. They have non-medical uses too such as in leadership. That’s because placebos cause the brain to release substances such as endorphins. There are others too. They make golfers golf better. They make online dates go better. These substances can help the body cure itself. That means they can help employees perform better. It’s a form of positive thinking. It’s external though. Someone, such as a medical professional, an expert or a leader, activates it. Thus, using the placebo effect to your advantage in this way is very doable. 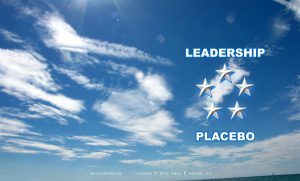 Five key elements exist to using the placebo effect to your advantage as a leader. Authorities hold great sway over people. They can change what they know is right. In terms of the placebo effect, an authority can be the leader, a process, a technology, an expert almost anything. It creates an aura of success around the suggestion. The suggestion is the behavior the leaders wants to see. “Do this and you’ll feel better.” Here the leader stating this is the authority. Do this and feel better is the suggestion. To arrive at this point though, the leader must use a process. A simple one is working to understand the situation. Yet, the leader, even if he understands the situation continues. “Making a big deal out of it” or “making something out of nothing” are common ways people express this. Good stories help here. The next step expresses belief in the employee. “I really believe that you can do this and you’ll feel better afterwards.” Again, this is more than a one-time utterance. Repeat it, again and again. Work it in at the end as part of the process. Embellish it. Lastly, the leader needs to take time to do this. Time shows value, importance. It helps to show the leader’s belief in the employee. It also helps to make the process bigger than it is. Another way of looking at using the placebo effect to your advantage as a leader is magic. The leader is a magician. She helps the employee to cure himself, to motivate himself. She does nothing tangible. She’s just there. Her authority, suggestion, process, belief and time help the employee to show how valuable he is. That translates into better performance. Why would he let that value go to waste when a leader believes in and appreciates him?